The early years of living in London are a time of my life that I haven’t mined very hard for stories and blog posts. I suppose those times were lived in such proximity with other people that it’s hard to recount some of the events without unwittingly dragging those others into it too. This week, regardless of that concern, I thought I’d remember one story of the times when my two friends and I shared flats and houses, first on Chiswick High Street, then in Ealing. I’ve changed the names of my friends to protect the unwary. They were good times and the laughs and stories were plentiful and memorable. This is just one tiny one. Daniel, Freddie (no that’s not their real names) and me shared several homes for several years. Daniel loved a practical joke. Let me rethink that last thought. It was never as simple as just loving a practical joke. It was more complex than that. It was a love for setting something up, staging it, and then seeing it paid off. In retrospect, Daniel's particular joy lay in the long game, the gag that took months or even years to finally pay off. Those ones were his delight. 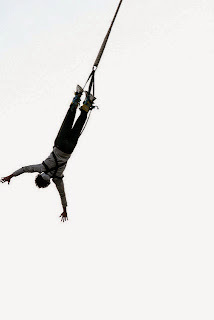 One of his very best involved Freddie’s Beloved Bungee Jump Video. Freddie had taken a trip to somewhere, I can’t honestly remember where. I want to say Australia but I can’t see how he could have afforded that. Anyway, he went somewhere and he did a bungee jump and the proprietors of the bungee jump place made a video of Freddie’s jump and they sold it to him as a memento of his day. Freddie brought this video back from his travels and, most of the time, it sat quietly at the side of the TV. It was only on those rare occasions when Freddie got pissed that the video loomed large in his clouded consciousness. At those moments, usually late on a Saturday night, nothing would satisfy him but that we all sat down and, yet again, enjoyed the spectacle of Freddie launching himself off that possibly-Australian precipice. Over time, these insistent bungee watching occurrences grew further and further apart until they finally seemed to peter out and die altogether. That was fine with Daniel. Because he began playing the Long Game. That’s why. One evening, some years after we finally gave up being forced to watch Freddie’s video, he and I were going to a house party. Daniel wasn’t going for reasons I can’t recall. He doubtless had something better to do. For reasons that are quite beyond me, Freddie sought out and packed his bungee video in his bag. Perhaps he anticipated getting pissed. As we left, Daniel drew me aside and said to me, “call me if anything good happens.” I didn’t pay much heed to that at the time but I did later on. The party went swimmingly. Actually, strike that. I have no idea how the party went. It was a house party, like many others, and I can’t find anything to distinguish the evening. Not until Freddie got his video out. Freddie was indeed pissed, so that was one reason he produced the memento, but he was off his home turf and it was unusual that he would wish to show off his diving skills on foreign soil, so to speak. I think his beer-clouded mind reckoned he might have a better chance of pulling if some unwitting girl became enamored of his pre-recorded exploits. Whatever the reason, he halted the music, commandeered the telly and demanded attention from everyone in the room. The video came on. There was Freddie, in the sunshine of someplace-or-other, being prepped on what-and-what-not-to-do by a jaded attendant while another similarly challenged helper bound up his ankles with thick rubber cord. Pre-Recorded Freddie shuffled over and took his place on the brink while Real-Time-Freddie exhorted everyone to stop trying to have fun and watch. On the video, Freddie leaned forward and prepared to fall and, in fairness, the people in the room were now poised in anticipation. Even a few nice looking girls had been hooked so perhaps there was some hope for Freddie after all. And you probably know what happened next because I’m telling you the story but you have to bear in mind that we didn’t know what was going to happen and, man, it was beautiful. Just beautiful. As Freddie launched, the video did that farting noise that anyone familiar with home video recording will remember. That downward-progressing disintegration of image that turns into screen filled static and white noise for a moment and then turns into another image altogether. In this case an old episode of Coronation Street. Somebody had recorded over Freddie’s Bungee Video. Freddie, pissed as he was, literally couldn’t believe it. He looked hard at me. “It wasn’t me.” I protested. The room was in stitches by this time. Freddie looked like a gobshite and all prospects of pulling were long gone. Surprisingly enough, Freddie, took it all in good stead after he got over the initial shock. He was a lovely guy like that. When things quietened down, I remembered Daniel’s words from earlier. I found a phone extension in an empty bedroom and I called him up. “Did he play the video?” He asked, straight away. Daniel had played the long game. Over a year before, he had gone to a professional company and had Freddie’s video copied. Then he had painstakingly reproduced every detail of the label from the bungee company. Then he had hidden Freddie’s beloved tape safely in his room, recorded Coronation Street over the copy at the perfect moment and planted the time bomb at the side of the telly. It was a lovely gag for sure. But the real loveliness lay in the patience of it all. The willingness to wait for it to play out whenever it might and to simply accept the fact that it might never do so. And, one final touch, not even feeling the need to be there when it finally delivered its payload. It was better to be elsewhere, just knowing it was happening. I remember Daniel and our time together with great fondness and with a little trepidation too. Although it’s getting on to thirty years since we went our separate ways, I sometimes wonder if there isn’t some other long game poised and waiting to play itself out, this time at my expense. I like to think I have a GSOH (please let that stand for Good Sense of Humour otherwise Christ knows what I’ve just admitted to) but I’m really struggling to come up with a response to today’s post. I guess I’m not much of a practical joker. And neither were my friends over the years because I can’t think of any jokes being played on me. Now surprises are a different thing. Or getting the perfect present. But I’ve never been the kind of guy who plays pranks and certainly not elaborate ones like this which is perhaps why I’m not much of a chess player. There’s a side of me that associates practical jokes with getting one over on someone; there’s a cruelty there. It’s why I was never fond of Game for a Laugh because a lot of the time it really wasn’t funny.